“Ads by Media View” is the label that you will find on advertisements generated by an adware program called Media View. The application is available at http://media-view.net/mediaview/exe/MediaViewV1alpha8932Installer.exe; however, the official website http://media-view.net is not accessible at the moment of writing. 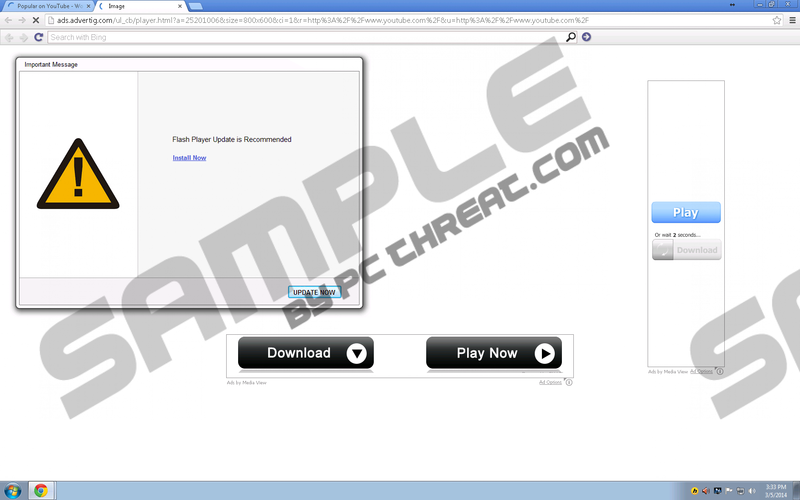 The application is installed as a browser add-on and is categorized as adware. You will find “Ads by Media View” pop-ups on your Internet Explorer, Google Chrome and Mozilla Firefox, and we recommend that you take action to remove the adware program once you find that you are being disturbed by the intrusive advertisements. Unlike other browser add-ons which display advertisements, the advertisements generated by Media View are highly obtrusive. They include web banner, pop-ups, pop-unders and in-line advertisements. The adware program can also open new tabs; sometimes it may open more than one tab, all of which are likely to provide you with unreliable websites. Not all of the advertisements displayed by the adware programs are labeled “Ads by Media View”. Usually, this phrase accompanies iframe advertisements, which are displayed on the sides of the web page, and in-line advertisements, which pop-up when you hover the mouse pointer over a word highlighted by the unwanted program. Media View advertisements are displayed on popular websites, such as Amazon, Target, Walmart, Best Buy and YouTube. The content of the advertisements is likely to have nothing in common with your search terms. You may be invited to update your Flash Player, visit a shopping website, install the FLV Player, take part in a survey, etc. “Ads by Media View” pop-ups are not the only inconvenience caused by the adware program. It has been found that a search bar can be added below the address bar. The search bar is powered by Bing, but before you are provided with the search results, you may notice that the name of Conduit appears on the tab for a moment. Conduit is well-known for its toolbars and search engine, which is usually promoted by the toolbars. In order to prevent adverse consequences related to Conduit, remove the adware program and the toolbar. In order to rid the browsers of the “Ads by Media View” pop-ups and web banners, you should implement a powerful spyware removal tool. The instructions given below may also help you delete the unwanted application; however, you should bear in mind that some unreliable files associated with the adware program may also be present on the PC. The application may monitor your browsing history and record your search terms; hence, do not hesitate to install a powerful anti-spyware tool. Our advice is to use SpyHunter because this application can remove adware, rogue anti-spyware programs, ransomware infections, and many other computer threats. Quick & tested solution for Ads By Media View removal.